This section contains the most frequently-asked questions about our products and services. Please use our keyword-driven search engine to find an aswer to your question. -- Select --AccessoriesAccessories for oscilloscopesAdapters for multimeters and multimeter clampsAnalyser oscilloscopes with remote interfaceBenchtop analogue oscilloscopesBenchtop digital oscilloscopesCable locatorCalibratorsCurrent clamps and sensorsEarth and resistivity testersElectrical installation testersElectrical testersElectrochemical MeasurementsElectromagnetic field testersInsulation testersLaboratory instrumentsLoggersMachine and equipment testersMicro-ohmmetersMultimeter clampsMultimetersOther testersPhysical and environmental measurementsPortable oscilloscopes with isolated channelsPower, energy and disturbance analysersProcessing and analysis softwareProducts for education and trainingRF wattmeters-reflectometersRelaysTelecom / network testers, etc. Question no.1 (ask on 25/03/2019) : Hello, I would like to know if my Metrix device is remotely programmable. If so, can I have the remote programming manual? Question no.1 (ask on 16/01/2019) : I need to update my FTV100 Photovoltaic installations Controller. What is the latest compatible version? Can I find it on the web? Question no.2 (ask on 16/01/2019) : I lost the manual instructions for my photovoltaic installations tester. Where can I download it? Question no.3 (ask on 16/01/2019) : I changed my PC, after that I lost the GreenReport software for my FTV100 tester. Could you transfer me an executable so I can install it? The GreenReport software is available on the link below, you can download and install it on your computer. The v4.6.1 version is compatible with operating systems: Windows 7, 8, 8.1 and 10. Question no.4 (ask on 16/01/2019) : I lost the operating instructions of the FTV200 tester. Can you send it to me? Question no.5 (ask on 16/01/2019) : I want to update the firmware on my FTV200 Photovoltaic Tester. What is the latest version? Are there any conditions to respect before installing it? Question no.1 (ask on 16/01/2019) : I have a PX110 Wattmeter that still works well. However, I have lost the user manual, and I need it to check the electrical characteristics of the instrument. Could you help me on this? Question no.1 (ask on 17/12/2018) : For my measurements with the CA1510, I need the air containment indicator, the Data Logger Transfer software does not allow an automatic calculation of this indicator. Do you propose another software compatible with the CA1510? Note: Unlike Data Logger Transfer, AQR software can not handle voluminous files. In this case, we advise you to use DL to retrieve your measurements data. Question no.1 (ask on 10/10/2018) : How to know the product replacing my device from the range Physical & Environmental Measurements ? Question no.2 (ask on 24/02/2016) : I have old Metrix multimeters. What are the current replacement models? Please find below a summary of the instruments which can be replaced with the MTX3290, MTX3291, MTX3292, MTX3293, MTX202 and MTX203. Question no.1 (ask on 15/10/2018) : What is the current replacement model for the CA8435 Power Analyzer? Question no.2 (ask on 29/06/2018) : What is the firmware version compatible with the Qualistar CA8335 & CA8435? Question no.3 (ask on 04/02/2016) : How to know which product replace mine ? For example, I have a CA8332B and a logger L320 that I would like to replace. These two products belongs to the category Power, Energy, Disturbance. Question no.1 (ask on 15/10/2018) : I have a problem with the battery of my PEL, is it possible to change it? However, if you still have a warranty on your instrument, you will lose all the rights to warrantees if you do so by yourself. In this context, you can refer to one of our Manumesure technical centers, an entity belonging to the Chauvin Arnoux group, which is responsible for all the checks, calibrations and repairs of the Chauvin Arnoux Group's appliances and other brands. Question no.1 (ask on 18/05/2018) : How can I get the curves obtained from my DOX3304 oscilloscope? Question no.2 (ask on 23/02/2017) : Once I have zoomed on my signal, I no longer have access to the cursors. What can I do about this? The cursors must be activated before activating the zoom and they will then be available to perform precise vertical and/or horizontal measurements. Question no.1 (ask on 01/06/2016) : We do not have power outlet in our electrical cabinet to supply our Qualistar. Is there another solution ? In order to extend the 10hours batteries autonomy, Chauvin Arnoux deleveloped a new accessory for the QualistarPlus. The PA31ER adapter is directly connected on the voltage inputs of the QualistarPlus, and allow you to supply the device as long as there is a voltage. The batteries will be able to take over in case of power cut. 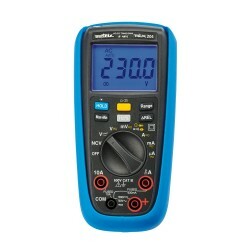 It accepts every voltages that can measure the QualistarPlus, 1000Volts AC and DC. Question no.1 (ask on 29/04/2016) : I want to use my F607 clamp on a 10x80 busbar. Is this possible? Yes, this is possible with the F607 clamp. Question no.1 (ask on 18/02/2016) : I cannot access to the applet ScopeNet. How to fix this issue ? You have to follow the policytool procedure (page 178 of the User Manual) in order to allow the applet on your computer. Warning : it is not possible to use Google Chrome, you will have to use Mozilla Firefox or Internet Explorer.